Dynamk Capital, a venture fund providing early stage and growth capital to innovative Life Science companies, announces today the addition of Reinhard Vogt as a new General Partner & Managing Director, effective immediately. Reinhard joins the fund currently led by Daniella Kranjac, Founding Partner, and Mario Kranjac, Founding Partner and General Counsel. Reinhard comes to Dynamk Capital with a wealth of industry knowledge, technology deal-side expertise and numerous technology licenses, acquisitions and integrations at one of the industry’s largest players, Sartorius AG. What this means to investors and portfolio companies is a winning combination of commercial and operational support derived from Reinhard’s experience with more than a dozen high-profile, accretive deals throughout his time at Sartorius. He was instrumental in building and transforming their filtration business from $30 million in the 90s, to what is now today the Sartorius Bioprocess Business of around $1.2 billion. Reinhard commented “Dynamk Capital stood out to me from the very start as it met an underserved market providing vital capital to life science companies making the leap from early stage to commercial success before exiting. I am excited to work with the Dynamk team again and apply this innovative approach to broader opportunities in the market”. Earlier in his career Reinhard was instrumental in transforming Sartorius’ strategy to become the leader in single-use bioprocessing technologies, essentially revolutionizing how biologics are manufactured. His track record includes technology licenses and acquisitions ranging from the Stedim SA and B. Braun Biotech transactions to more recent deals including TAP Biosystems, Cellca, BioOutsource and Umetrics. He served as Executive VP and Member of the Board of Sartorius AG for over 10 years and as Director of several companies of the Sartorius Group. Reinhard has a unique talent and proven track record of value creation by targeting companies and technologies that when integrated create a solution aimed at speeding the development and commercialization of therapeutics. The end result is a success story where biotech pioneers get access to the best in class technologies and technology providers realize maximum commercial value. Decades of navigating the competitive life sciences landscape are the basis of Dynamk’s instinctive ability to not only identify winning technologies but to strategically map out gaps they can fill in the offering of companies for exit strategies. This combined with Dynamk’s vast network ensures portfolio companies are well positioned from the start to exit with maximum returns. Daniella Kranjac, Founding Partner of Dynamk Capital, talks Life Science and Biotech trends at the Global Family Office Investment Summit, November 10-12, 2018, Dubai, UAE. Englewood Cliffs, NJ, November 28, 2017 - Dynamk Capital, a recently launched life sciences venture capital fund, today announced an exciting new investment in early drug discovery by adding Envisagenics, Inc. to its growing portfolio. Dynamk Capital invested $500,000 in Envisagenics, leading the $2.25 million seed round alongside other investors. Envisagenics, a life science company applies artificial intelligence to the genetic sequence of patients to discover new therapies. Its proprietary cloud-based discovery platform SpliceCoreTM uses machine learning to prioritize new drug target candidates from patients’ RNA. ENGLEWOOD CLIFFS, NJ, Sept. 26, 2017 /PRNewswire/ -- Dynamk Capital has announced a first close for its venture fund providing early stage capital to innovative companies providing tools, technologies and services within the Life Sciences sector. The fund is on track for a final close in 2018 and expects to invest in 8-10 companies over the next several years. Since founding in 2016, Dynamk has been actively cultivating deal flow as well as relationships with limited partners and strategic investors. Dynamk Capital provides a look into how the BioProcess industry has evolved, and what the future holds for this fast-growing sector. Dynamk is honored to participate in the premier bioscience-focused leadership training offered by the University College of London. The UCL Vision Course is an intensive program tailored for emerging leaders and execs in Life Sciences navigating the intersection of bioscience, technology and business! Are you an Entrepreneur in Life Sciences? Looking for perspectives on securing growth capital. Read our recent article in BioProcess International. Best Practices for Sourcing Private Equity Investment Opportunities on November 29, 2016 as part of the Capital Roundtable Masterclass Series. Daniella Kranjac to make opening remarks for the 2nd Annual Stevens Institute Women's Leadership Conference, October 29 and panelist at the first EQELLE Women in Entrepreneurship Event, November 4. Daniella Kranjac of Dynamk Consulting LLC and Dynamk Capital Advisors joins the Stevens Institute of Technology Board of Trustees as a charter member. About Stevens: Stevens Institute of Technology, The Innovation University® is a premier, private research university in Hoboken, NJ overlooking the Manhattan skyline. Stevens is home to three national research centers of excellence, as well as joint research programs focused on innovation in: healthcare & medicine, sustainable energy, financial systems, defense & security and STEM education. Daniella Kranjac of Dynamk Capital, to participate as an invited panelist at the NJ Tech Council HealthTech Conference, May 19, 2016 on innovation and funding trends in healthcare, biopharma and life sciences. 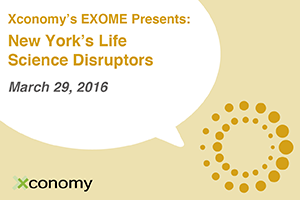 Dynamk Capital is proud to be attending Xconomy's EXOME presents: New York Life Science Disruptors!